This is a combination of two classic dish of England -Apple Pie and Apple Crumble. 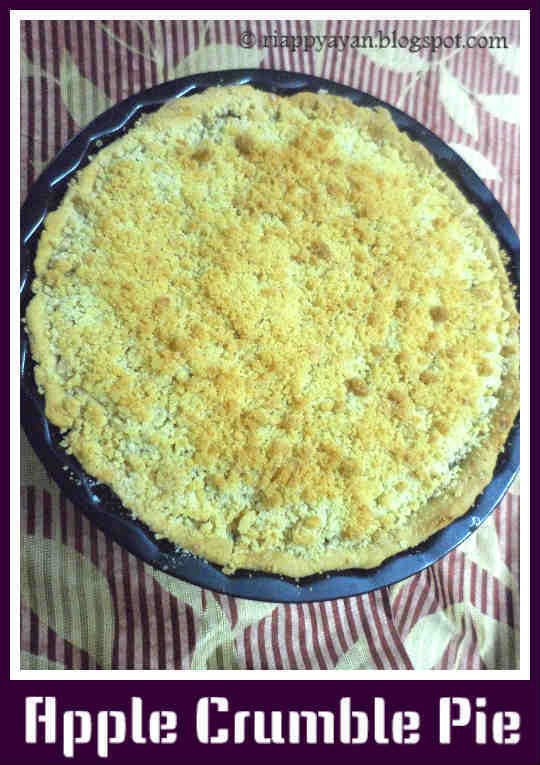 It has a pie crust, cinnamon flavoured apple as a filling and a crumble on top. It tastes divine. This is in my to try list for long. 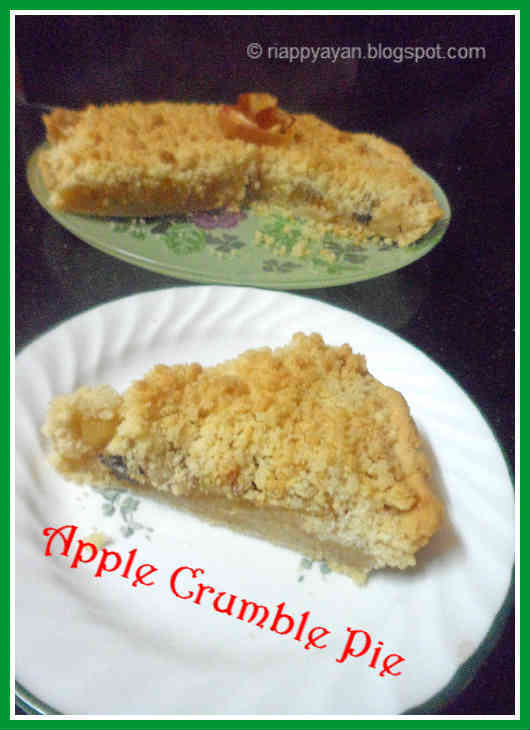 Actually, I wanted to try out first only Apple crumble, then I spotted this recipe one day. I couldn't gather enough courage to make the pie crust. 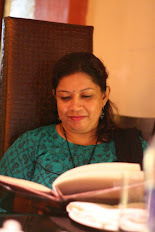 Googled for many more recipes and finally decided to try this one. I was also reluctant seeing this long method, but believe me, it's a very easy-to-make once to start it. 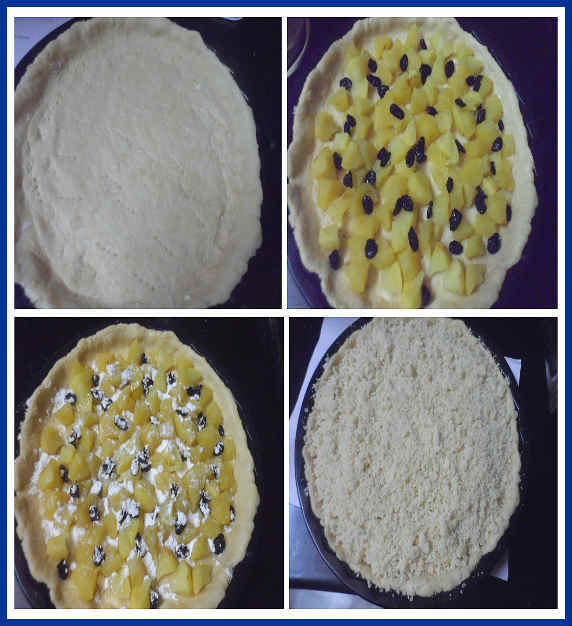 It took me 30 minutes to prepare the whole thing, then another 45 minutes baking time and a classic dessert was ready to serve, If you havn't try this one, go for it. Prepare your pie pan : Brush with a little butter and sprinkle a bit of flour all over the pan. Make the Crust: Combine flour and salt, mix well. Add butter and mix nicely with the flour. Now add iced water, one tablespoon at a time, until mixture forms a ball. No need to knead much. 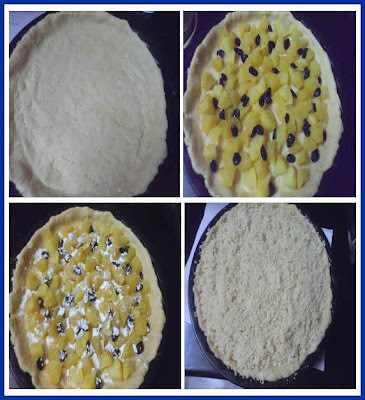 Dust a clean plain surface with little flour and roll out the flour ball evenly to cover the size of your pie pan. Place the rolled out dough over the pie-pan, prick with a tip of the fork all over the crust, so it doesn't rise and chill in the refrigerator for at least 1/2 an hour. 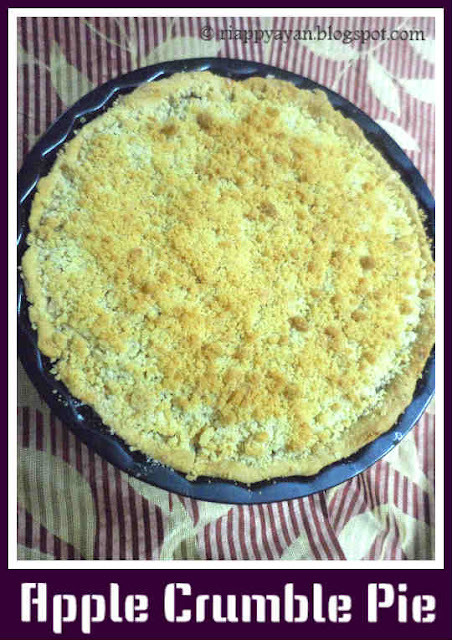 By the time, you prepare the filling and the crumble. 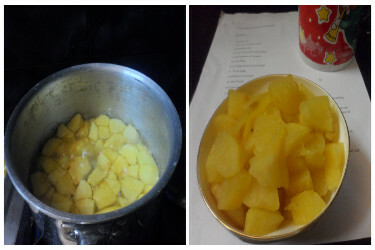 Make the Filling : Peel and slice apples to medium size chunks. Place one inch of water in the bottom of a large pot. Add apples and cook, stirring occasionally, approximately 5 minutes. Add 1/2 of the sugar in there. You want the apples semi-opaque but not mushy(see the below pic). Drain apples well and keep aside. Make the crumb : Add the crumb ingredients to a large bowl. Using your hand, mix everything together until it forms a coarse crumb. Assemble : Take out the chilled pie crust, arrange cooked apples and raisins on it. Sprinkle rest of the sugar(depending on your desired sweetness) and cinnamon powder over it. Add your crumb mixture evenly on top. Bake at 400°F/200 C for 35-40 minutes or crumbs change their color to brown. 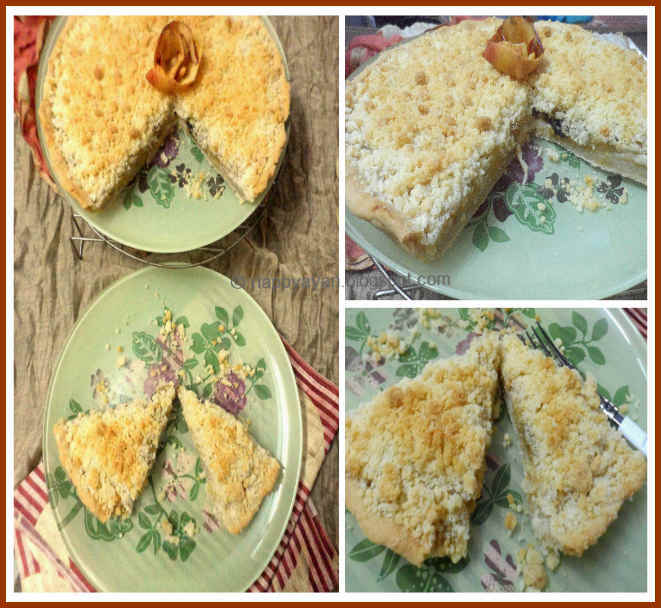 You may need to cover center of pie with foil during baking if your crumb topping is browning too fast.